Our Poetry Friday selection actually fluttered into my email inbox on Thursday. I get poems emailed to me every day from a site called Your Daily Poem. How great is that? A poem a day. It's enough to make your day a good one. So, the poem that inspired our Poetry Friday activities is titled "The Migration of the Butterly Tattoo" and it was written by Tony Gruenewald. 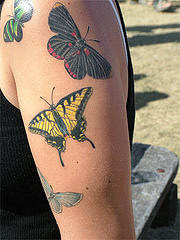 I loved it immediately for its originality and for a personal story that I have around a butterfly tattoo. We're writing our vignettes right now, and it seemed like a little tattoo story share around was in order. I told my butterfly tattoo story (which I will not repeat here), and then you all chose a tattoo that you would get if you could. You needed to explain what the tattoo would look like, its significance, and locate an image that shows that somehow relates to your tattoo. Here are some student blog posts about this topic. Student 1 wrote about wanting a tribal tattoo to show off while playing bass in a future band, Student 2 wrote about being "Undecided" about his tattoo because he's afraid of what it will look like as he ages, and Student 3 would dedicate her first tattoo to her grandparents. It was interesting to see and read about the variety of tattoos that you all would choose. Thanks for letting me read about your choices. After we completed this vignette writing activity, we switched from poem reading to poem writing. Except, you didn't really have to write anything. You "wrote" a Book Spine Poem, which consists of layering books upon books and creating a poem using the titles of each book in your pile. I took a snapshot of each of your stacks and will print them out for you so that you can include them in your final project. Here are a couple examples of your Book Spine Poem creations (click to make larger). I chose these two images because they both incorporate Cormac McCarthy's book The Road, but in different ways. **Reminder: Binders for your vignette projects are due on Tuesday.